The Photoshop CC 2018 update has plenty to look forward to beyond the typical annual upgrade of Adobe’s subscription desktop photo/graphic design app. It integrates support for emerging technologies like 360-degree spherical panoramas and the HEIF (High Efficiency Image Format) image file format adopted by Apple for macOS 10.13 and iOS 11. 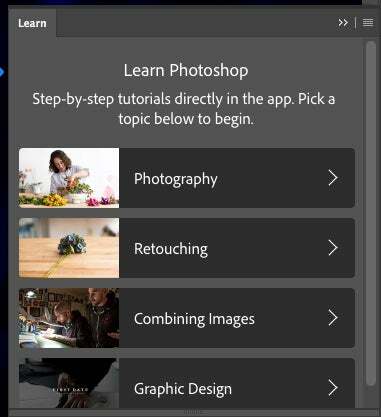 Combined with new features like variable fonts, paint stroke smoothing, a symmetry tool, a Curvature Pen tool, direct social media sharing, instant access to synced Lightroom photos, enhanced search, brush management, layer copy and paste, and more, Photoshop CC 2018 welcomes newcomers by incorporating training directly into the app. You can view step-by-step instructions, but only on Photoshop’s sample images. While Adobe pioneered step-by-step post-process recipes in its consumer Elements line, it always relied on photo pros to use documentation or tutorials to figure out the right moves for themselves. That changes with Photoshop CC 2018 wherein interactive software how-tos are now incorporated into the interface via the new Learn panel. It’s not exactly the same as Elements, where you can choose which photos to put through the process. Workflow recipes arrive with Photoshop CC 2018. Instead, Photoshop CC 2018 provides annotated steps using its own sample images covering categories like Photography, Retouching, Combining Images, and Graphic Design, each containing three to five instructional modules. You can follow the steps in the example or bring up the additional text instructions, available from the Help icon. It would be even better if you could start with your own photos in the interactive examples, but it’s a step in the right direction. Tool Tips are enhanced with tiny animations. Also new are Rich Tooltips—enhanced labels complete with tiny graphics and animations—that demonstrate how each tool works, though not every tool has annotated instructions. 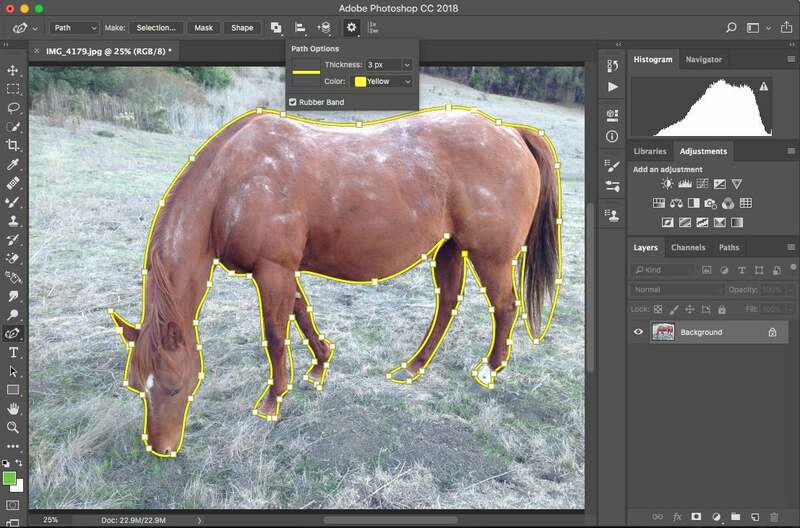 Perhaps Adobe will build out that feature so the majority of tools have visual tips, but this is a good start. 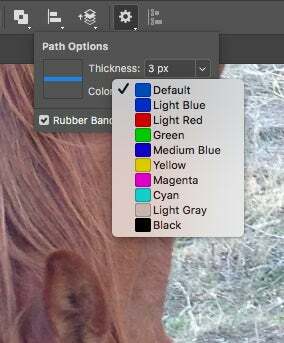 Photoshop jockeys who know every tool by heart, can disable the feature in the preferences. 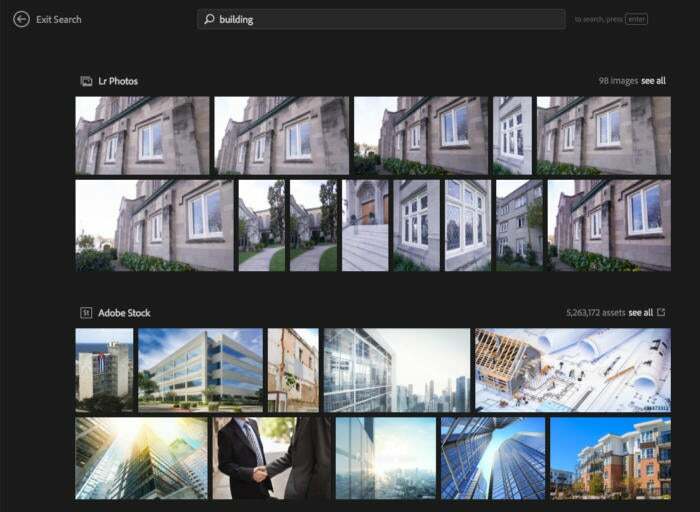 Photoshop users can now hook into their Lightroom photos via the cloud, with all synced images accessible from the app’s Start screen. All you need to do is click on the photo you want, and it will be imported directly into the app. No fuss, no muss, and a genuine time saver. Most of the time I was able to access photos from the cloud fairly instantaneously. However, occasionally, downloading was slow or failed entirely. Alas, Adobe giveth and Adobe taketh away. How? 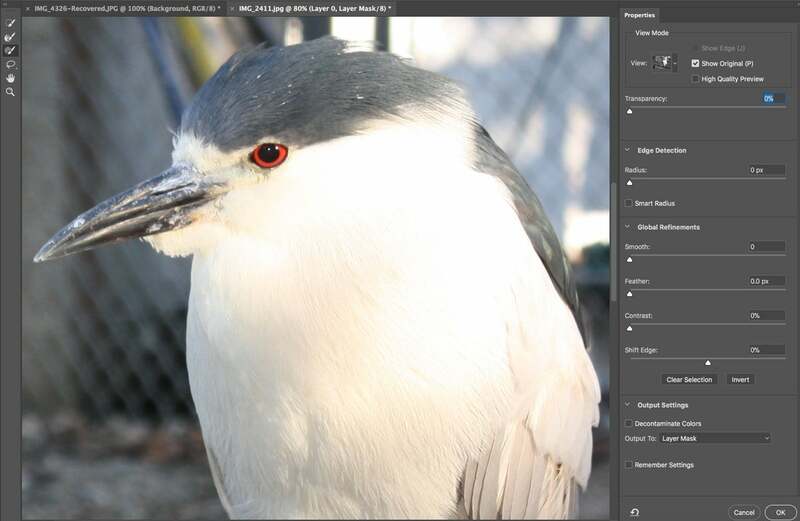 For several years, Photoshop has been available only by subscription, either via the standard Creative Cloud for $49 per month or the Creative Cloud Photography Plan for $9.99 per month, but Lightroom was still available as a perpetual license. That has changed. With Photoshop CC 2018 and a rebranded Lightroom Classic CC for desktop, Lightroom is now subscription-only. The standalone Lightroom 6 will continue to be sold, but it’s the last perpetual Lightroom version, with Adobe’s support for camera updates coming to a halt at the end of 2017. Photography Plan subscribers get both Lightroom Classic CC and a simplified, mobile-oriented, cloud-friendly Lightroom CC (formerly Lightroom for mobile) with their subscription, along with 20GB of cloud storage and the Spark suite of cloud apps. 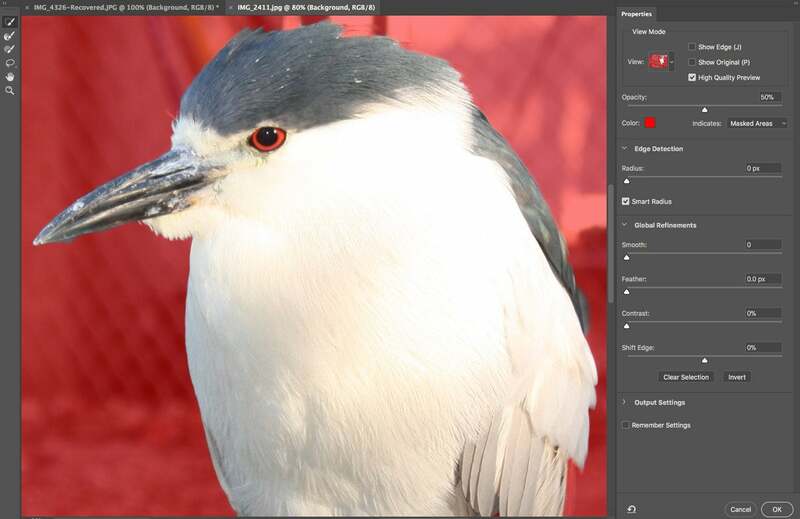 Your Lightroom library is now accessible from Photoshop’s Start screen. 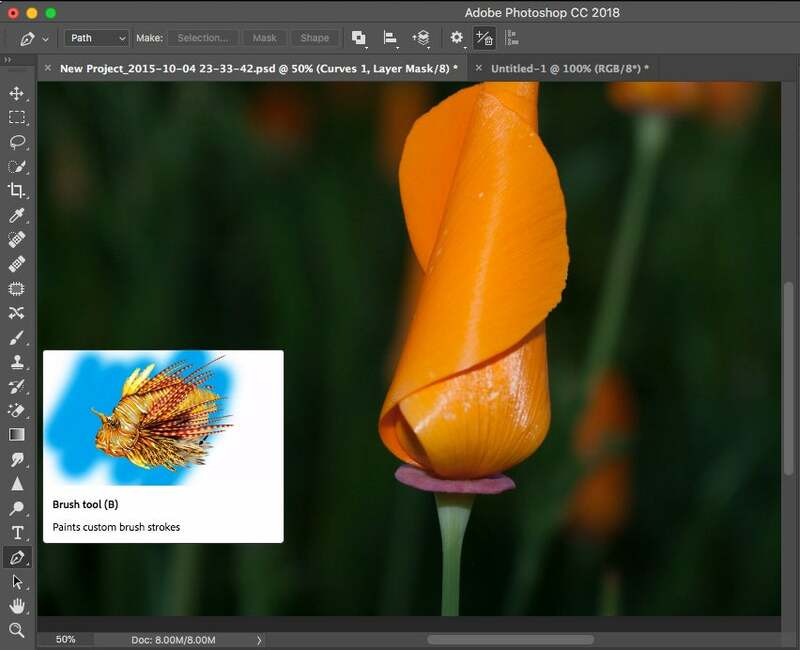 Adobe’s Sensei artificial intelligence engine also springs to life in the Photoshop Start screen, letting you search directly for untagged photos or visual content from your synced images. 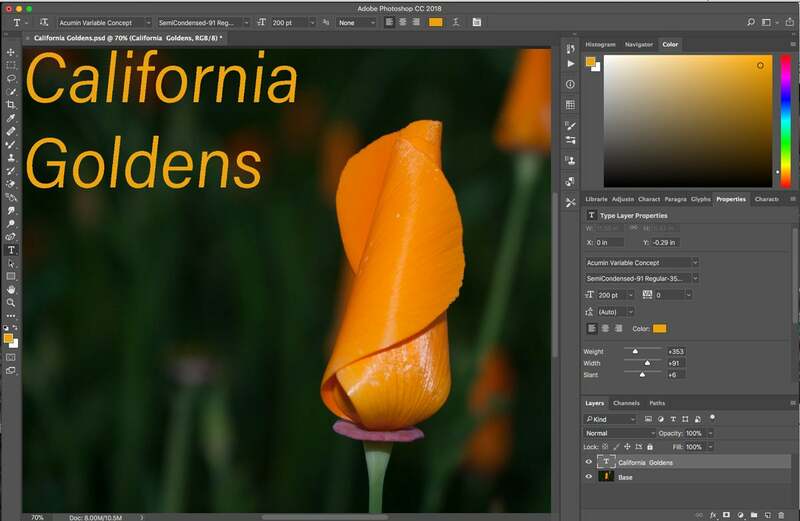 It also automatically integrates relevant Adobe Stock content and instructional videos. 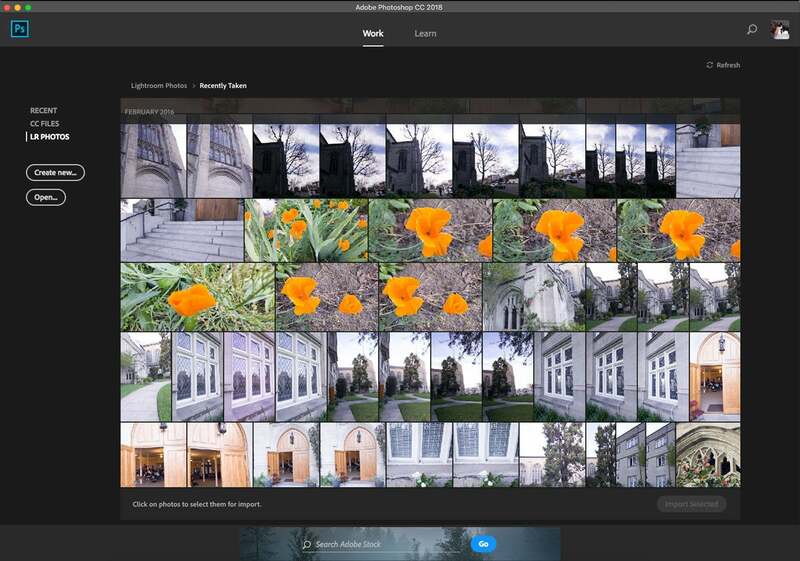 AI-enhanced searching finds specific photos by content and provides results from Adobe Stock. 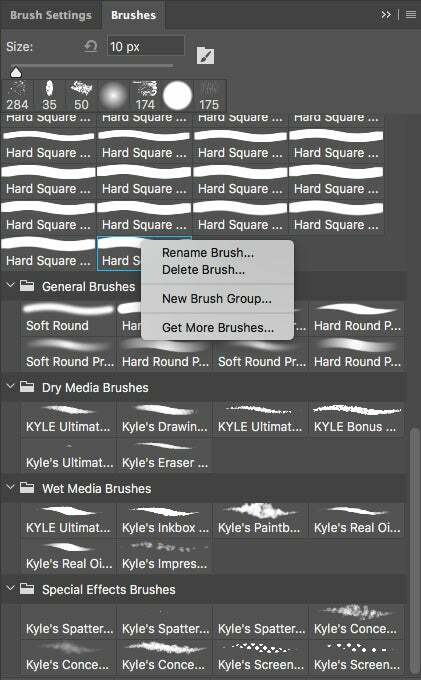 Drag and drop brushes to organize and access them in any order or group you want. Adobe has overhauled its brush management workflow to ease and enhance handling and organization. You can now drag and drop to organize brushes and group them into folders and subfolders for easier, more intuitive access. Say you’re working on a painting for which you have gathered a specific brush collection, you can now access all those brushes in a single folder. You can now save options like opacity, flow, blend modes, color, and size within brush presets and convert all your current brush tool presets into brush presets in one go. But you can still work the old way, if you prefer. Photoshop CC 2018 features new brushes by designer Kyle T. Webster, whose company, KyleBrush.com Adobe just purchased. Over 1,000 of Webster’s custom designed brushes are now available for free via the Get More Brushes menu. Brush stroke smoothing, which can now be controlled more granularly in the Options Bar, removes the jaggies from your brush, eraser, pencil, and mixer brush strokes. The smoothing feature has several modes and an optional tiny marker called a leash tail so you can follow the brush path visually as you draw. 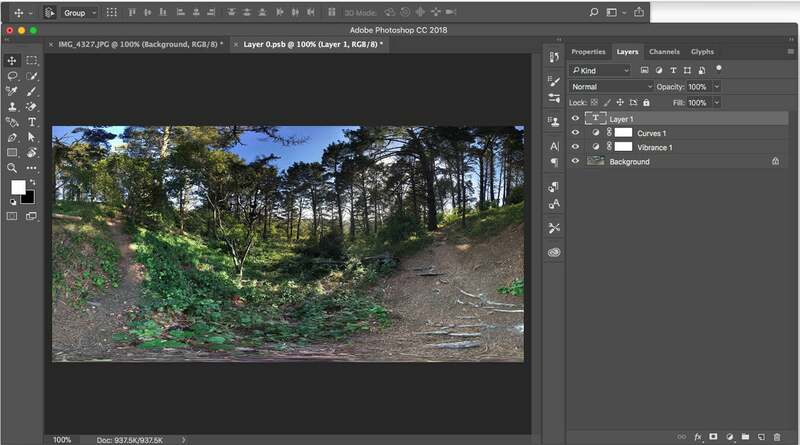 The new Photoshop lets you open and edit 360-degree equirectangular spherical panoramas that you can export for use with VR and panoramic viewers. Editing 360-degree panos works only in Photoshop’s 3D workspace, but with it you can accomplish most of the effects you are accustomed to on your 2D images, which is quite impressive. 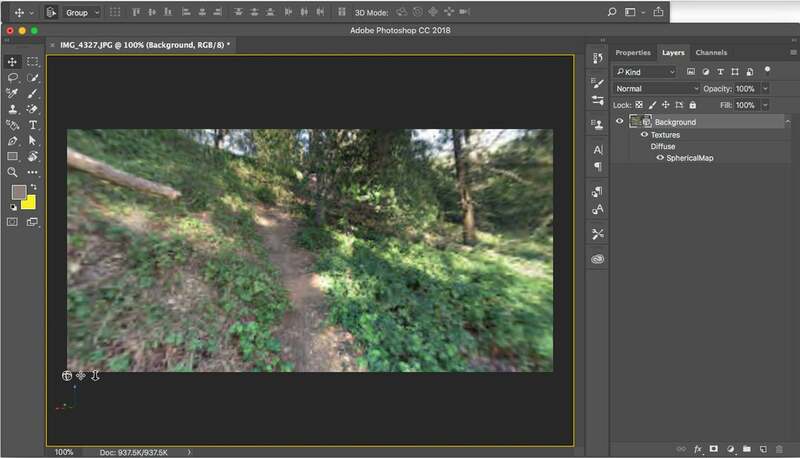 Once you import your 360-degree pano, you can edit it by drawing, painting, adding adjustments, removing objects, hiding seams, or adding text. For non-destructive layer based edits, you can choose the spherical map, and in the Layers panel, add layers with various edits. When you’re done, you can export and post to Facebook and other media that can display this format. Photoshop’s Pen Tool isn’t going anywhere, but if you’d rather have an easier way to create paths, Adobe has introduced a Curvature Pen tool. Like the similar tool in Illustrator, it is designed to easily create curved or straight paths, path segments, or shapes by clicking points instead of adjusting Bezier curves. You can then grab any point, adjust, or add points to better fit the selection. 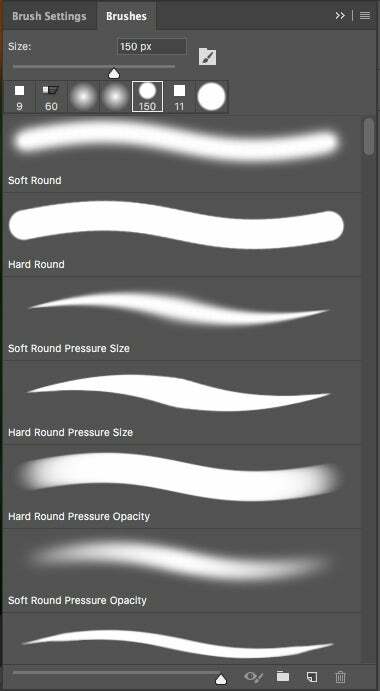 The Curvature Pen tool arrives on Photoshop, and not a moment too soon. Add and remove points at will. Ever struggle to follow the path? No longer. You can alter path thickness and color so they are easier to spot. The Curvature Pen tool is accompanied by another ease-of-use update to path lines, which define your paths onscreen. You can choose bright colors and adjust line thickness to make paths easier to see. These path updates are optional features, but ease the way for newcomers to work effectively with paths. For designers who work extensively with type and are picky about how type looks on their layouts (name one who is not), Photoshop CC 2018’s Variable font, a new OpenType font format that has been described as “a single font file that acts like multiple fonts,” lets you control and customize parameters like width, weight, slant, or optical size. Just search for the Variable name in the Font pulldown menu. Once you land on the variable font, it is highly visual and easy to use, offering speed and flexibility in adjusting font variations and weights on the fly. You have to search for Variable in order to access these specific fonts, or check the label on the font name. Whichever font you choose, just use the slider controls to adjust characteristics. 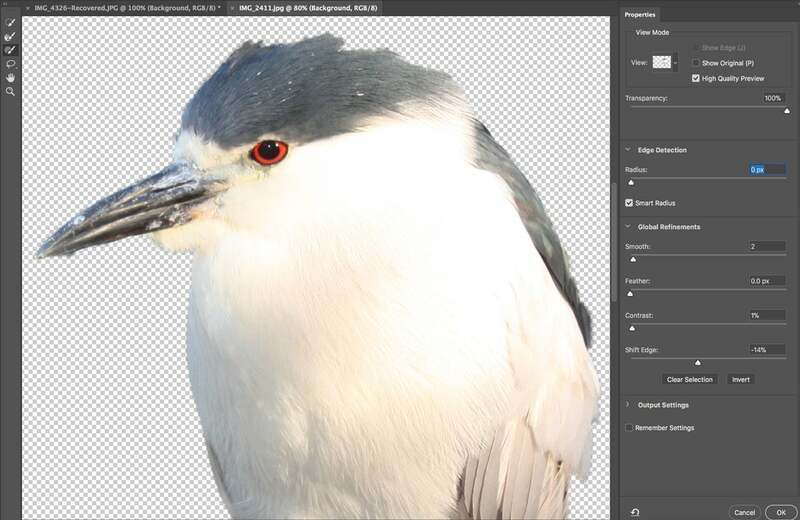 This enhanced command has been outfitted with an updated algorithm that gives you quick and easy results for separating foreground and background for hard-to-select elements like hair, fur, and feathers. It does a quick, accurate job with relatively little effort. Updated algorithm makes selections easier, faster, and more accurate. Photoshop CC 2018 has some updated goodies for Camera Raw 10. 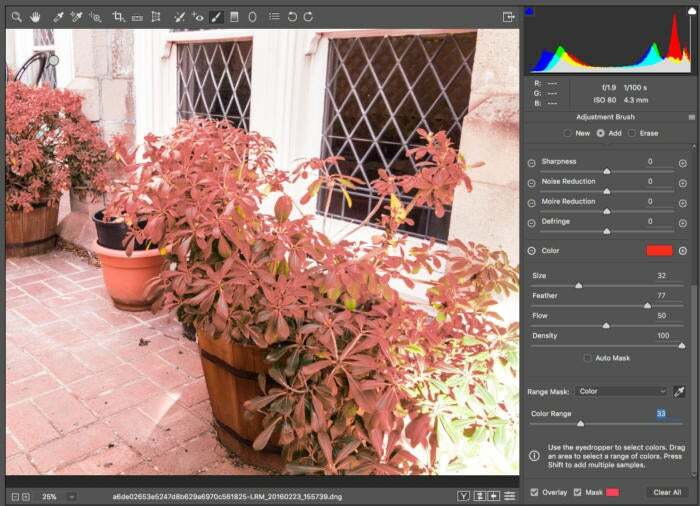 Color and Luminance Range Masking controls let you define more precise masking areas for local adjustments. The range masking tools use either color or tone to precisely pinpoint areas of your image according to color or tonal values. 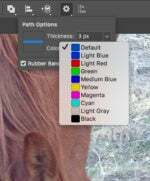 You can make quick selections with the Adjustment Brush or the Radial Filter/Graduated Filter and later refine the selection with the range masks. Slider tools let you select a wider or narrower range. All adjustments are non-destructive. This is not the most intuitive control I’ve ever seen, but once you get the hang of it, it offers a sure-fire way to shield certain parts of your raw image from local adjustments. 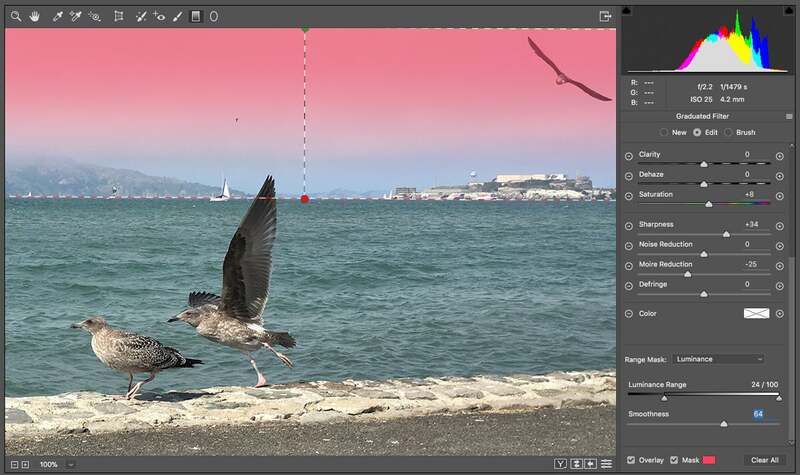 The new Camera Raw Range Masking feature makes precise adjustments by color or luminance. The red parts are the mask. 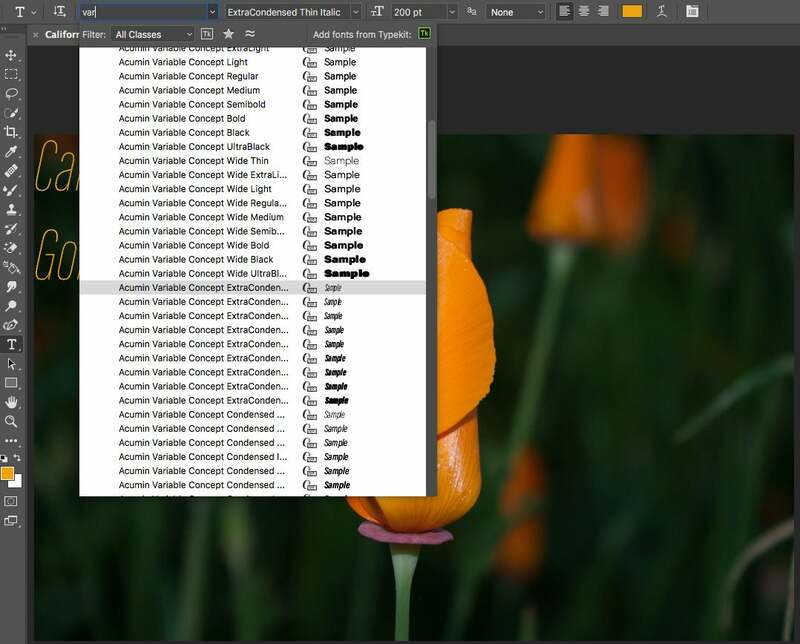 Preserve Details 2.0 and Enable Paint Symmetry, both tech previews you can switch on optionally in the preferences, are powered by Adobe’s Sensei AI framework. Preserve Details, on by default, uses deep learning to more accurately upscale photos without sacrificing detail, preserving texture and edge details, including hard edges and text, or hair and skin tones, and even food, that can appear soft or distorted with previous resampling techniques. For most images, even upscaled to 300 percent, I did not notice a huge improvement. You may start to see the effects a bit more by pushing enlargements to 400 percent and beyond, but overall, I found the improvement to be subtle for most of the shots I tried. 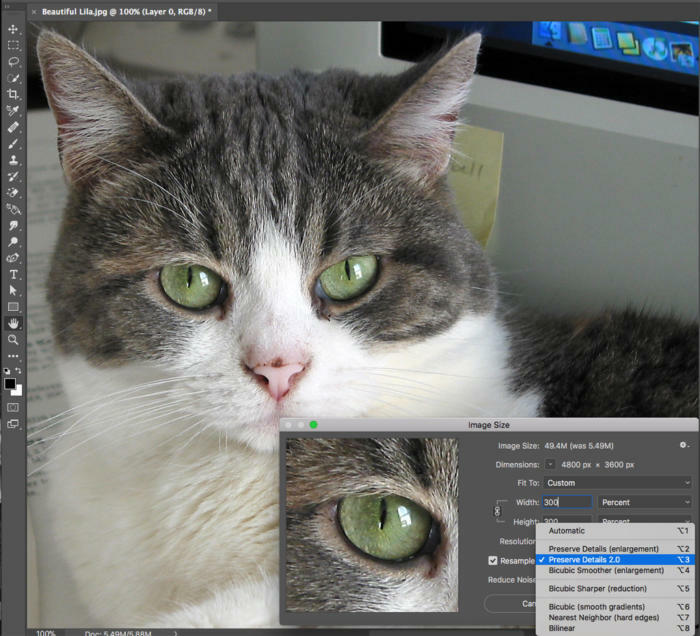 Bump up your image size while retaining more detail. 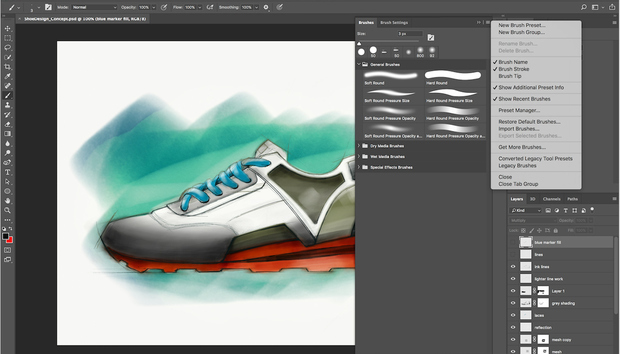 Photoshop now lets you paint symmetrically while using the Brush, Pencil, and Eraser tools, a feature whose ease and fluidity targets painters, sketchers, and designers. Just click the Butterfly icon in the Options bar and select from among several symmetry types, which are simply preset paths. Strokes are reflected in real time across the line of symmetry. Any path can be designated a symmetry path, so you can easily create your own. Photo and graphic pros and serious hobbyists should be really pumped about Photoshop’s extensive variety of new tools and enhancements for a wide spectrum of creative output. Performance was rock solid: I noted exactly one crash for the entire testing period. The Wow headliner—360-degree editing—recruits a whole new class of users, as does the in-app training. 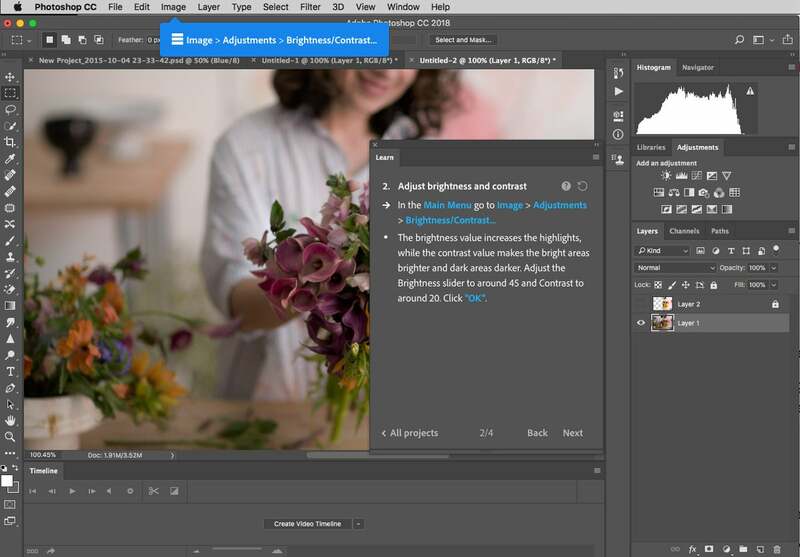 Photoshop’s updates and new features reflect a profound thought process about meeting changing user needs—from variable fonts to Lightroom integration to brush organization—that may well encourage non-subscriber pro users to fork over a monthly fee for it and its Lightroom companion apps, both desktop and mobile. That said, Adobe is targeting photo pros and advanced enthusiasts for Creative Cloud subscriptions, and is steering consumers to its Elements line of powerful, but traditionally licensed software.